Liebig St was in desperate need of an upgrade, but is the lack of free parking killing the CBD? 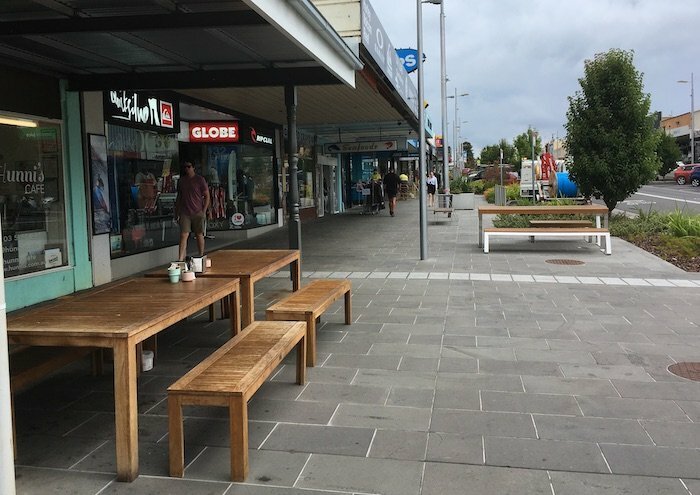 There was no doubt that Warrnambool’s grotty, rundown old Liebig St needed a serious makeover, but is the $18 million upgrade being stuffed up by a lack of free parking? Almost 3000 people who physically signed a petition for the return of central, 90-minute free parking say it is. The 2833 signature petition – no small number – was tabled at the Warrnambool City Council meeting last Monday but barely raised a mention because of the much bigger news story that night – racehorse training on Levy’s beach. 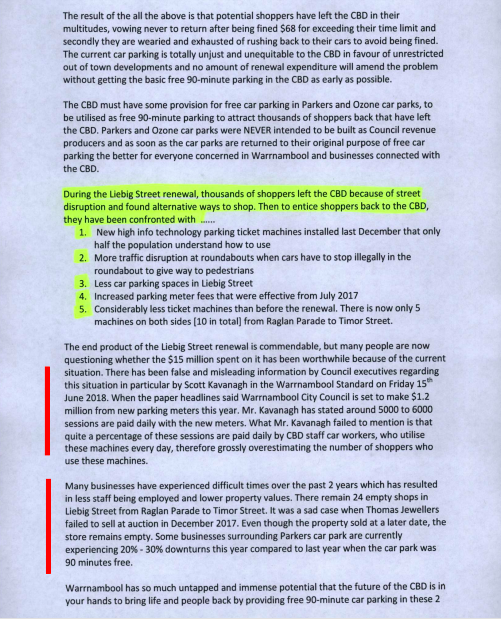 The petition is pushing for permanent, 90-minute free parking in Parker’s Carpark (behind the Commonwealth Bank) and the Ozone carpark (behind the new post office) and was gathered by long-term CBD trader Max Taylor, from Taylor’s clothing and surf store, which has been trading in Liebig St for decades. Max pulls no punches in the three page-document (see images at end of story) he added to the petition. “Potential shoppers have left the CBD in their multitudes”, he says, because of damaging combination of expensive parking, confusing meters and lack of meters (only 10 in the whole street) that leave people worried they will be fined $68 for overstaying. Some traders around Parker’s carpark, he says, have experienced a 20-30% loss in trade compared to when the 90-minute free carparking was in place during the street works. And there are still 24 empty shops between Raglan Parade and Timor St (we won’t go into how many others sit empty along Lava and Timor). 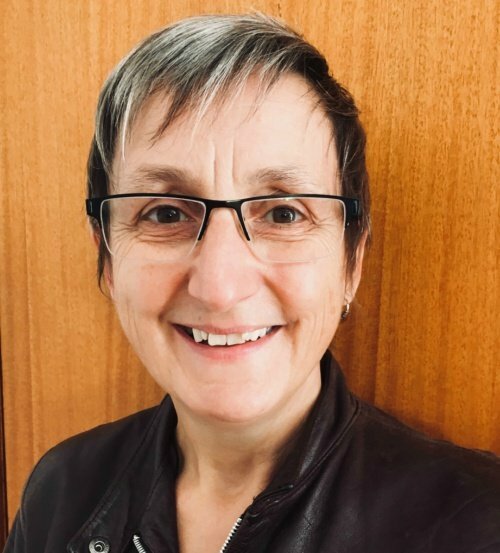 Max also accuses the council Director City Infrastructure, Scott Cavanagh, of making misleading claims to the local newspaper about the number of shoppers parking in the CBD. The 5000-6000 people who parked every day included a lot of city workers, Max claims, thereby “grossly overestimating the number of shoppers”. 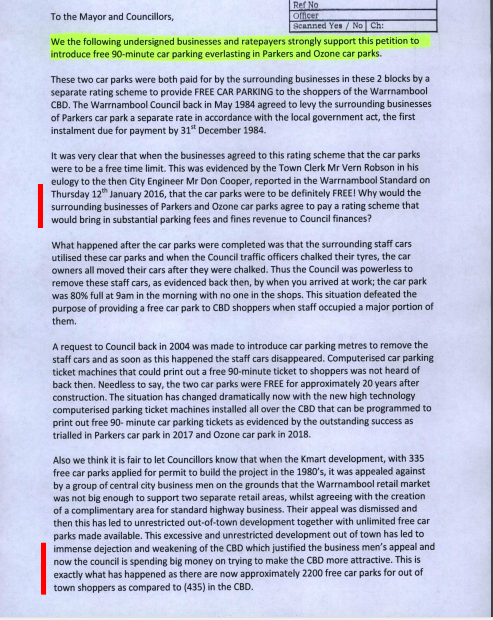 He also points out that local traders around the Parker and Ozone carparks paid a special levied back in 1984 to build the new FREE off-street carparks in Parker Arcade and the Ozone. Meters were added in 2004. Stormy weather: navigating the roundabouts in Liebig St can mean a lot of stopping and starting. A lot has changed since 2004. Online shopping arrived. 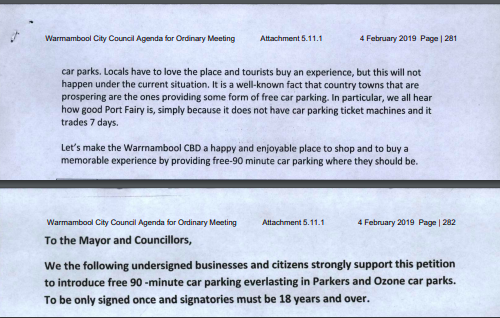 More shopping centres have been built on the fringe of Warrnambool, offering more than 2000 free car parking spaces. And then there are the new, pedestrian friendly crossings in and around Liebig St which are so pedestrian friendly that drivers potentially have to brake before they get to the roundabout, in the roundabout, and leaving the roundabout. My personal favourite is driving from Liebig St down Lava St, past the Centrelink, where you give way to pedestrians coming into and leaving the roundabout, then cross an ugly road hump, give way to buses leaving the bus zone and roll up to another pedestrian crossing – all within 50 metres. I am all for slower traffic, but that really is ridiculous…and messy. Maybe we just need more time to get used to it. Maybe we can all download the app and pay for parking that way. Or maybe, as Max fears, people will avoid Liebig St unless it is absolutely necessary and shop somewhere else. For our long-suffering, high rent paying traders, that would be the worst scenario. It is worth mentioning, as Max does, Port Fairy has no parking meters and seven-day trading. The little town won yet another award for being the most popular among tourists. They just might be on to something over there. Max’s petition, as per standard council procedure, sits on the table for 30 days and will be discussed at the next council meeting. 100% behind free parking in liebig st.
Would also like council to reconsider the crossings at the roundabouts. People aviod as it takes so long sometimes just to get from one end to another. As much as people recommend and protest its only falling on deaf ears at the council, as far as they are concerned, they did a great job. Ps its ONE street, what about the others that shops trade in?